It's the season for the Super Bowl ads, and Mercedes has got its first. It has the Coen Brothers helming it, the great Peter Fonda, to the sound of Steppenwolf "Born to be wild" and with hints of the classic movie "Easy Rider". The name of the commercial "Easy Driver" says it all. With such credentials what could go wrong? Sadly, a lot. The ad left me unfazed. 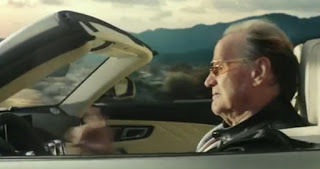 It has nothing of the Mercedes charm it displays in other ads, it has little finesse, and bah - it is just a nicely shot piece of action which activates no emotions. Perhaps this being an ad for the AMG branch of the car manufacturer - you know, the sporty division - finesse was not a requirement. On the plus side, the Coen brothers have a car "built to be wild" (as the end line says) to flee such criticisms with. But then again, I am not the average Super Bowl watching target audience who needs brash force, braggadocio, or a Mexican wall. Which why perhaps I appreciated it less than I should have.